Rebecca Jane "Jennie" (Minerd) Conley Woodmancy was born on March 22, 1852 at Hexebarger, near Kingwood, Somerset County, PA, the daughter of Charles and Adaline (Harbaugh) Minerd. She was married twice, and was one of our first known cousins to reside in Chicago. Jennie had dark hair and grey eyes. At about age 14, she and her parents moved to a farm at nearby Nicolay, near Mill Run, Fayette County, PA.
On Oct. 25, 1874, when she was 22, Jennie married John 25-year-old Conley (1849-1907), also spelled "Conly" and "Conelley"). John was a native of New York State, and his father an immigrant from Ireland. John was a cooper (barrel-maker). They had a daughter (or foster daughter), Jane "Margaret" G. Beutel, born in 1880 in Pennsylvania. The Conleys first lived at Springdale, near Pittsburgh, Allegheny County, PA, and later moved to Chicago, Cook County, IL, when he was transferred in his work. When the federal census was taken in 1880, they made their home in East Deer Township, Allegheny County. The photo combination seen here, of a couple standing on porch steps, shows John and Jennie. It's not known if this photo was taken in Pittsburgh or Chicago. The date of this photo also is unknown. One of Jennie's cousins, Amy (Minerd) Tilbury Thorne, also settled in Chicago circa 1870, making their residence in the city's Fifth Ward. The period of the Conleys' lives between 1880 and 1900 is shrouded by the misty haze of the past. Evidence suggests that they may have migrated to Buffalo, NY and to Nebraska for a time. But by 1900 they had settled for good in Chicago. When the census was enumerated in 1900, Jennie, John and Margaret resided together in Chicago, on Bowen Avenue. Their 25-year-old nephew, William Conly, also lived under their roof. That year, John worked as a foreman in a glue factory. Circa 1907, their address was 7040 Prairie Avenue. Sadly, John passed away in Chicago on Dec. 5, 1907, at the age of 58. Unfortunately, nothing is known about the cause or circumstance. A death notice in the Chicago Tribune noted that funeral services were to be held in Holy Cross Church, with the casket to be borne by carriages to Mount Olivet Cemetery. The Tribune also provided Jennie's maiden name of "Minerd" and asked that newspapers in Buffalo, Uniontown and Pittsburgh please reprint the notice. His death is listed in the Illinois Statewide Death Index of the Illinois State Archives, spelled "Conley" (certificate #00018022). A photograph of his grave marker shows the engraved name spelled as "CONLY." The Conley home in Omaha, NE, date unknown. Note the man on a bicycle. The census of 1910 shows Jennie living on Prairie Avenue in Chicago with her married foster daughter Margaret Beutel and her husband Joseph "Ben" Beutel, a police sergeant, and their three children. During the 1910s, Jennie married widower John L. Woodmancy (1859-1929), the son of David and Cascinda (Morrison) Woodmancy. He was an old friend from Fayette County who had lived in Iowa for decades since 1880, and was a dairy farmer. She was seven years older than he. While the family name originally had been spelled "Woodmancy," John and Jennie generally spelled it "Woodmency" during their married life in Iowa. John had been married once before, to Ida A. Good (1856-1906). John and Ida made their home in Grundy Center, Palermo Township, Grundy County, IA, and had three children -- Edward F. Woodmancy (born 1875), Martha B. Woodmancy Dilly (1886) and David D. Woodmancy (1894). The 1900 census shows this family living on Second Street in Grundy Center. In 1906, Ida died, and the census of 1910 shows John and his son David residing together in Grundy Center, with John making a living as "buyer - live stock." After marriage, our Jennie and John moved into his home in Iowa, in Grundy Center, Grundy County. John's presumed brother Frank Woodmency (1856-1940) also resided in Grundy Center. Jennie kept in communication with her daughter in Chicago by writing postcards. On Oct. 15, 1915, she sent Margaret a card reading: "Dear Margaret all well. washed today. had forty hours the first of the week. a dandy day. going out to Bob [illegible] with John this evening. write back. Mama." Above: Woodmancy hay mowing operation in Iowa, 1923. Below, L-R: Jennie with John in town and with a littler of pigs, and by herself. In 1923, either Jennie or John is believed to have taken the farming photo seen below. In the caption on the back are these words: "Archie & Paul moving upland hay." The photo was developed and printed at a studio in Hamburg, IA, and was found in the collection of Jennie's brother Lawson Minerd. The identities of Archie and Paul are unknown, but could be the names of the horses. Jennie occasionally returned home for visits. The photo seen here was taken circa 1895 in the Minerd home at Nicolay, just a few years before her parents died. Another such visit was in July 1912, when, as reported in the Daily Courier, she "arrived here yesterday to visit with her sister, Mrs. Lucinda Hall, on Sugar Loaf, for a few weeks." 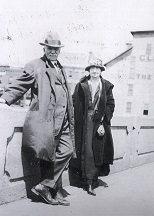 She also is seen in family reunion photos in the late 1920s taken at Confluence, Somerset County, PA. The 1920 census of Grundy County shows the couple living on Marshal Street in Grundy Center. John's occupation that year, at the age of 65, was "stock buyer." The census-taker speller Jennie's name as "Jane" and wrote her age as 66 when in fact it was closer to 68. The news was telegraphed immediately to Jennie's sister, Sadie Luckey, in Dawson, Fayette County, PA. The telegram did not give particulars, though it was known that he had been in poor health. The Connellsville Daily Courier eulogized that he "was born and reared at Sugar Loaf, near Ohiopyle.... At the age of 21, he went West and located in Iowa where he was engaged in buying and selling stock." Jennie outlived her second husband by eight years. In August 1930, she returned to her home region of Fayette County and attended the annual Minerd-Miner Reunion held at Shady Grove Park with her sisters Martha Gorsuch, Sadie Luckey and Allie Overholt and brother Lawson Minerd. Her name was published in an account of the affair in the Huntingdon (PA) Daily News, in a column authored by her niece Laura Jane (Minerd) Williams. She relocated to live with her widowed, 50-year-old foster daughter Margaret in St. Paul, Ramsey County, MN. In their household in the year 1930 were Margaret's five younger children -- Roberta C. Beutel, Bernard J. Beutel, Bernadette A. Beutel, Frank T. Beutel and Frances Beutel, and lodger William J. Wampler. She passed away on Aug. 16, 1937, at the age of 85. She was buried at Grundy Center. Foster daughter Jane "Margaret" Conley (1878-1943) was born on Dec. 26, 1878 (or 1880) in Pennsylvania. She was taken into the family of John and Jennie (Minerd) Conley and raised as their foster daughter. She married Joseph Benjamin "Ben" Beutel (1873- ? ), a native of Missouri, and they resided in Chicago at least from 1904 to 1917. They had eight known children -- Jean Inez Fraas, Mary Beutel, Margaret Gertrude Ruby, Roberta Clair "Bunny" Fahrendorf, twins Bernard J. Beutel and Bernadette A. Peterson, and twins Frank T. Beutel and Frances Kane Tabor. The two sets of twins are said to have been born 14 months apart. When the federal census was taken in 1910, the Beutels made their home in Chicago, on Prairie Avenue, with Joseph working as police sergeant on the city force, and Margaret's widowed mother boarding in their home. They remained on Prairie Avenue at least through 1915, as documented by a postcard Margaret received from her remarried mother now living in Grundy Center, IA. Ben studied law in the evenings and eventually obtained his juris doctorate degree. He was employed by Aetna Life Insurance as an in-house attorney. But fate intervened when he was stricken with cancer. The family then moved to Minnesota. In 1920, the Beutels lived on Edgerton Street in St. Paul, Ramsey County, MN, with Ben employed as a checker in a packing plant. With his health failing, Ben returned to Chicago for medical treatment, and did not recover. The precise information about his demise is not yet known. Margaret passed away on Nov. 9, 1943, at the age of 65. Daughter Jean Inez Beutel (1903-1931) was born on Oct. 31, 1903. She married Marshall Fraas (1896-1980). They had four children. Tragically, Jean died in 1931 at the age of 29. Marshall outlived his ill-fated bride by nearly five decades and made his home in Superior, Douglas County, WI. He passed away in October 1980. Daughter Mary Beutel (1905-1970) was born Oct 3, 1905. She lived in Ventura, Ventura County, CA. Mary died Feb. 7, 1970 at the age of 64. She apparently never married had no children. Daughter Margaret Gertrude Beutel (1909-1987) was born on New Year's Day 1909. At the age of 26, she married Harold Augustus Ruby on June 1, 1935. They had a double wedding with her sister Roberta. The Rubys lived in Des Moines, Polk County, IA and had 10 children. Margaret passed into eternity on July 8, 1987. Daughter Roberta Clair "Bunny" Beutel married Red Fahrendorf. She and her sister Margaret were married in a double wedding ceremony. Heartache shook this family when Bunny died the next year in child birth on Jan. 4, 1937. Son J. Bernard Beutel (1915-1998) was born May 6, 1915, a twin with his sister Bernadette. He married Elsie Malik ( ? - ? ), and they had two children. The family resided in Saint Paul. Bernard died on May 31, 1998, in Saint Paul, at the age of 82. Daughter Bernadette A. Beutel (1915-1991) was born May 6, 1915, a twin with her brother Bernard. She married Elmer Peterson ( ? -1984) and they had four children. The family made its home in Duluth, Saint Louis County, MN. Elmer died on July 27, 1984. Bernadette lived for another seven years as a widow. She joined her husband in eternity on July 23, 1991. Son Frank T. Beutel (1917-2003) was born on Jan. 22, 1917, a twin with his sister Frances. In about 1940, when he was age 23, he married 23-year-old Eileen McMonigal (1917-2004). They were wed for a remarkable 63 years and resided in Saint Paul, Ramsey County, MN. During World War II, Frank served in the U.S. Armed Forces and was awarded the Purple Cross and Bronze Star. The couple had seven children -- Robert Beutel, Thomas Beutel, Sister Eileen Beutel OSB, Gerald Beutel, Gretory Beutel, Therese White and Patricia Hallback. Frank made a living for many years in sales for Glidden Paints and H.B. Fuller Company. Said the Saint Paul Pioneer Press, he was "active in church and community, particularly in the healing ministries." Frank died in Saint Paul on Oct. 19, 2003. Burial was in Fort Snelling National Cemetery, and an obituary printed in the Pioneer Press, stating that he was survived by 10 grandchildren and two great-grandchildren. Eileen passed into death just a few months later on Jan. 16, 2004. Grandson Robert Beutel wed Lois Yellowthunder. Grandson Thomas Beutel wed Linda. Grandson Gerald Beutel wed Barbara. Granddaughter Therese Beutel married Douglas White. Granddaughter Patricia Beutel was united in married with Jeff Hallback. Daughter Frances Beutel (1917-1983) was born on Jan. 22, 1917, a twin with her brother Frank. She lived with her mother until her mother died on Nov. 9, 1943. Frances married John Kane, and shortly after marriage he passed away, she then married Al Tabor. He also only lived a couple of years after marriage. They had no children. Frances made her home in Saint Paul. She passed away on Oct. 5, 1983.